BRICS and BIMSTEC leaders in Goa. With the eighth BRICS summit coming to a successful close, Indian Prime Minister Narendra Modi summed up the proceedings by stating that the five countries were united in their efforts to combat terrorism, a “key priority” for their countries, since it hampered development. BRICS - a bloc comprising Brazil, Russia, India, China and South Africa - agreed at the end of their eighth summit that combating terror, including cross-border terror, would be a "key priority" for them and they were united in their efforts to combat it, said the Indian Prime Minister, as he summed up the salient parts from the Goa Declaration, issued at the end of the 8th BRICS summit, which India hosted in the western state of Goa. It is traditional in the group for the host leader to sum up the most critical part of the deliberations held by the leaders. "We agreed to close coordination on tracking terrorists, their funding and weapons," he said. Development and equitable growth was the other key focus area of the BRICS summit which concluded on Sunday, October 16, with the adoption of the Goa Declaration and Action Plan, which stated, “BRICS countries represent an influential voice on the global stage through our tangible cooperation, which delivers direct benefits to our people. In this context, we note with satisfaction the operationalisation of the New Development Bank (NDB) and of the Contingent Reserve Arrangement (CRA), which contributes greatly to the global economy and the strengthening of the international financial architecture,” the leaders stated in the Goa Declaration. “The BRICS countries’ role in the global economy continues to grow,” President Putin said. “In 2007, we accounted for less than 24 percent of global GDP, but this year, we account now for more than 31 percent. The five BRICS countries are active participants in developing multilateral decisions and agreements that will accelerate global growth and trade and help to resolve the unemployment issue,” explaining the importance of their decisions. Without naming Pakistan, Modi referred to that country as the "mother-ship" of terrorism at the closed door session of the BRICS leaders. "This country shelters not just terrorists. It nurtures a mindset... that loudly proclaims that terrorism is justified for political gains," the Indian foreign ministry spokesman quoted Mr Modi as saying at a closed-door meet of the BRICS leaders, including President Michel Temer of Brazil, President Putin of the Russian Federation, President Jacob Zuma of South Africa and President Xi Jinping of China, a close ally of Pakistan. "We agreed (that) those who nurture, shelter, support and sponsor forces of violence and terror are as much a threat to us as terrorists themselves," Mr Modi said. "We underscored the need for close coordination on tracking sources of terrorist financing and target the hardware of terrorism, including weapons' supplies, ammunition, equipment and training," the Indian Prime Minister said, adding, "BRICS needs to work together and act decisively to end this menace of terrorism." His concerns were reflected in the strong language in six paragraphs on terrorism included in the Goa Declaration issued at the end of the BRICS summit. Mr Modi stressed that it was important for BRICS nations to act both "individually and collectively" to provide a "comprehensive response" to terrorism, which he said had "grown more lethal and adept at the use of technology". A "selective approach against terrorism," he cautioned, was both futile and counterproductive. The Indian PM received strong support from Russian President Putin, who said after his summit meeting with Mr Modi October 15 that Russia unequivocally condemned cross-border acts of terrorism against India, while expressing “strong support” for India in its fight against “cross-border” terrorism. 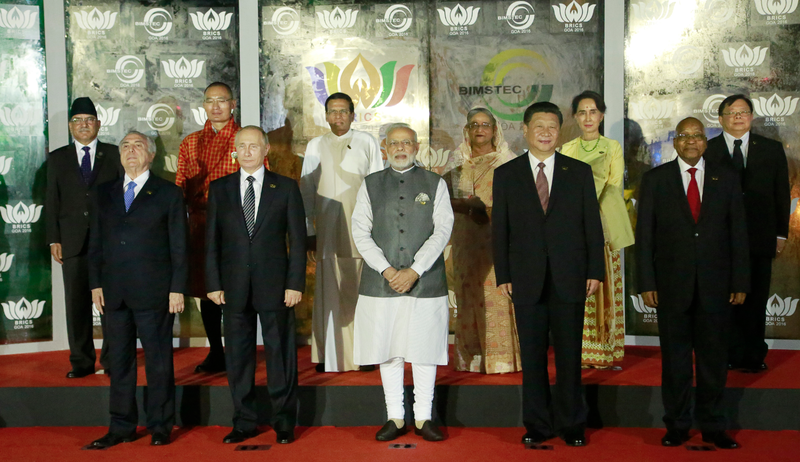 “We want to fight terrorism together, we all will collectively work on it,” Mr Putin reiterated while speaking at the BRICS outreach session with the seven member countries of BIMSTEC late Sunday. BIMSTEC, or the Bay of Bengal Initiative for Multi-Sectoral Technical and Economic Cooperation, is an organisation comprising a group of South Asian and South East Asian countries. These are: Bangladesh, India, Myanmar, Sri Lanka, Thailand, Bhutan and Nepal. As is traditional, India had a choice of which neighbours to invite and chose to invite the leaders of BIMSTEC, all developing countries, to jointly discuss developmental and other issues with BRICS leaders. At the Ufa summit in 2015, Russia had invited leaders from the countries of the Shanghai Cooperation Organisation (SCO) for the outreach with BRICS leaders. “In order to reach out and enrich our understanding and engagement with fellow developing and emerging economies, we will hold an Outreach Summit of BRICS Leaders with the Leaders of BIMSTEC member countries - Bay of Bengal Initiative for Multi-Sectoral Technical and Economic Cooperation comprising of Bangladesh, Bhutan, India, Myanmar, Nepal, Sri Lanka and Thailand. The meeting will be an opportunity to renew our friendship with BIMSTEC countries as well as to jointly explore possibilities of expanding trade and commercial ties, and investment cooperation between BRICS and BIMSTEC countries, while advancing our common goals of peace, development, democracy and prosperity,” the Goa Declaration stated. Brazil’s President Michel Temer said he wanted to “congratulate PM Narendra Modi for the effort to take BRICS out of meeting rooms, to public spaces,” he said, referring to the enhanced agenda of outreach programs which have been held through the year, most recently with the BRICS Trade and film fairs. “We all can expand our partnership in different areas now,” said President Temer. “We (BRICS nations) have similar challenges, we can work together to overcome them,” the Brazilian President said. “The world is faced with new inter connected challenges which require our concerted efforts to resolve,” South African President Jacob Zuma said at the plenary session. Chinese President Xi Jinping, whose statements were closely analysed, was convivial in his remarks, saying, “We need to deepen our partnership, we BRICS countries are good friends, brothers and partners that treat each other with sincerity. October is the season of harvest and this year marks the tenth anniversary of BRICS cooperation,” the Chinese President pointed out. Summing up the deliberations held during the 8th summit, the host said, “In a world of uncertainties, BRICS stands as a beacon of peace, potential and promise. We are celebrating 10 years of our partnership under BRICS, it has produced strong benefits of cooperation,” Mr Modi said. Speaking to journalists after the BRICS summit, President Putin dismissed western suggestions that BRICS was losing its relevance, in part because of tensions between countries like India and China. “Every country, and even more so major powers, has its own interests that may run counter to those of its closest allies. That said, what underpins the mutual interest of BRICS countries? It is underpinned by the similarity of their economies and the objectives that they face. This is so obvious that you do not even have to be an expert to understand this. All it takes is to look at their economic structure, development patterns, growth rate and objectives,” President Putin said. “It is this objective interest in maintaining contacts and promoting cooperation in various areas that lies at the core of our association and encourages optimism. Furthermore, to be honest I am pleased with this meeting, because for the first time I saw that all parties involved were genuinely interested in developing relations within this framework, which could pave the way to cooperation in specific areas,” the President noted. “BRICS countries,” he said, “work together fruitfully within the World Trade Organisation and the G20 and share common positions on global development and reforming the global financial and economic architecture. Reiterating their resolve for a just and equitable world order to ensure development can take place, the BRICS leaders stated, “We note the global character of current security challenges and threats confronting the international community. We reiterate our view that international efforts to address these challenges, the establishment of sustainable peace as well as the transition to a more just, equitable and democratic multi-polar international order requires a comprehensive, concerted and determined approach, based on spirit of solidarity, mutual trust and benefit, equity and cooperation, strong commitment to international law and the central role of the United Nations as the universal multilateral organisation entrusted with the mandate for maintaining international peace and security, advance global development and to promote and protect human rights,” the Goa Declaration said.